Take in the history and autumn colors of Canada & New England! 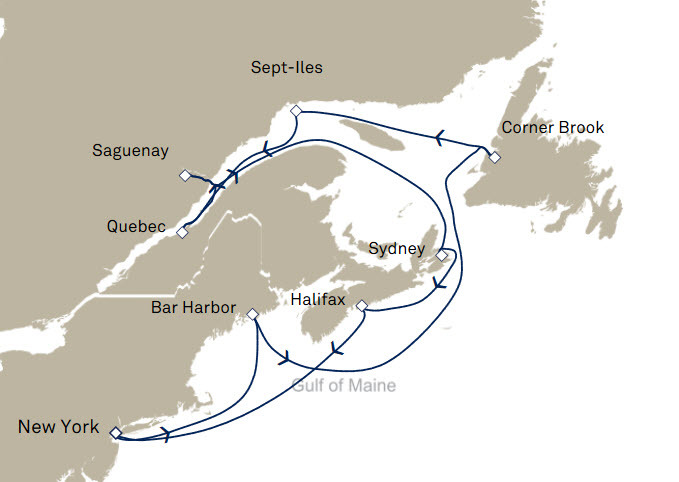 Relish 14 nights sailing in style on your round trip from New York to New England and Canada's diverse coast. Each day brings new wonder, from fjords and cliffs to islands and cosmopolitan capitals. When you book by Jan. 31, 2019 - you will receive up to $300 Onboard Credit per stateroom plus Reduced Deposit. ($100 - Oceanview, $150 Balcony, $200 Princess Grill Suite, $300 Queens Grill Suite). Receive up to $300 Onboard Credit plus Reduced Deposit when you book by Jan. 31, 2019! Take in the beauty and history of the Canada and New England Coast while you sail on Cunard’s luxurious flagship Queen Mary 2. Enjoy Cunard signature experiences such as afternoon tea, gala balls in the Queen’s Room, exclusive events with esteemed experts, uncrowded spaces, and Broadway-caliber shows. Price is per person based on double occupancy, availability and subject to change without notice. Taxes, Fees and Port Expenses are additional at approximately $322.36 per person. Conbinable with launch fares, group fares, regional promotions and past guest fares available at the time of booking. Offer is not combinable with flash promotions. The Cunard logo and logotype are registered trademarks of Carnival plc, an English company trading as Cunard Line. Queen Mary 2, Queen Victoria and Queen Elizabeth, are registered trademarks owned by Cunard. All rights reserved in the United States and other countries. Ships’ Registry: Bermuda. © 2018 Cunard.